Many people have questions about the Zero Additional Taxes Bond Issue on the November 8th ballot. So Olmsted Falls City Schools has put together a series of short videos (about 60 seconds each) related to this important issue. Be sure to watch OFCS Treasurer Emily Dales in this latest video as she explains how the Zero Additional Taxes Bond Issue works. To view the new video now, please click HERE. “Everybody do the Bulldog rumble . . . “ Yes! 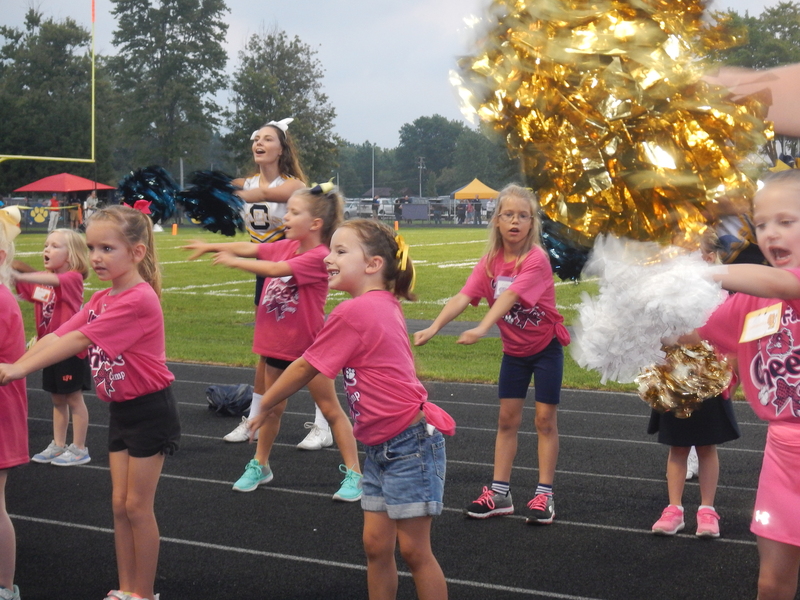 That was one of the many cheers our mini cheerleaders chanted to help lead our varsity football team to victory over Amherst last week. A special thanks to the OFHS cheerleaders for working with ECC, F/L and OFIS students. Everyone did a super job! The OFHS guidance counselors invite parents to this year’s Coffee & College informational sessions about the college application process. The morning sessions are from 8-9 a.m. October 10th and November 7th in the OFHS Media Center. 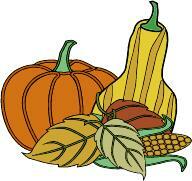 The next evening session is from 6-7 p.m.* on October 24th in OFHS Room W3. (*Please note change in start time for evening events.) All are on Mondays. To see an informational flyer, click HERE. The Greater Cleveland West Suburban College Fair will be from 6:30-8 p.m. October 3rd at Baldwin-Wallace University’s Lou Higgins Recreation Center. Representatives from 140 colleges and universities will be at this event. OFMA will also sponsor a Fill the Truck fundraiser as it partners with Easter Seals Northern Ohio again. The clothing drive will be in the Board of Education’s parking lot on Oct. 22nd and 23rd. For more details, view the flyer by clicking HERE. The Olmsted Falls Parks & Recreation Board will sponsor the annual Falls Day in the Park from 1-4 p.m. Sunday, October 2nd at East River Park. Come and enjoy an afternoon of free family fun, including music, kid’s activities, jugglers, face painting, crafters and other vendors. Food and refreshments will be available. The Olmsted Falls High School marching band also will perform. September is National Library Card Sign-up Month. Kids in grades Pre-k through 12 may redeem a special bookmark at any Cuyahoga County Public Library branch for a free gift (while supplies last), a new library card and fine forgiveness during this month. Lunch will be provided. Sign-up in required. Be sure to check out Superintendent Dr. Jim Lloyd in this week’s video as he explains what issue 117 is all about. To view the new video now, please click HERE. 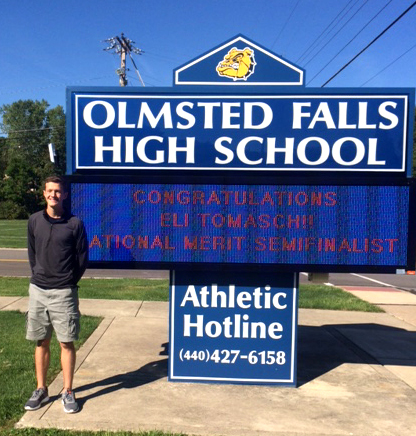 Congratulations to Eli Tomasch, who was recently named a National Merit Scholarship Program Semifinalist, and to four other seniors – Mark Drobnak, Morgan Finau, Ouen Mali and Molly McCafferty – who earned Commended status. highest scorers. 16,000 of those high performers are Semifinalists, who have an opportunity to continue in the competition and advance to Finalist standing by meeting several additional requirements. The other 34,000 high performers were named Commended Students on the basis of a national Selection Index score. Congratulations to these fine students receiving honors in the 2017 National Merit Scholarship Program. Best wishes to Eli as he continues his journey toward possibly being named a Finalist and scholarship recipient. 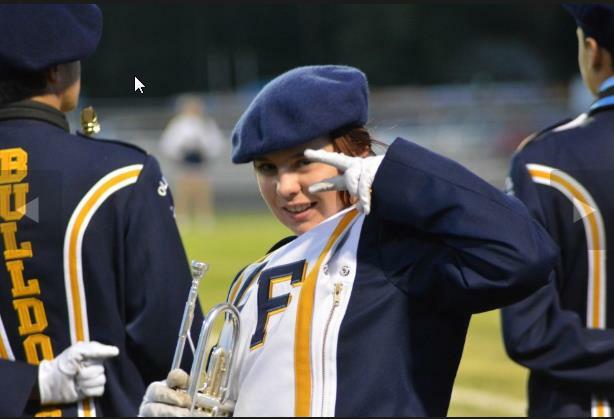 The Pride of Olmsted Falls, the Bulldog Marching Band is one of 32 finalists in the Cleveland.com “Best of” contest. It is up to the public to determine those that will advance in the competition. Voting continues until 7 a.m. Sept. 28th – THAT IS THIS WEDNESDAY! To vote for the Bulldogs Marching Band, click HERE and go to the end of the article to cast your ballot. Vote as often as you wish. The top eight bands will advance to the quarterfinals. Goooo Bulldogs! As of Sunday afternoon, Olmsted Falls was in 12th place. We need your votes! LeadingAge magazine’s September/October issue features Falls-Lenox’s Bulldog Buddies program with The Renaissance. The article discusses the importance of intergenerational partnerships that have far-reaching benefits for all ages involved. 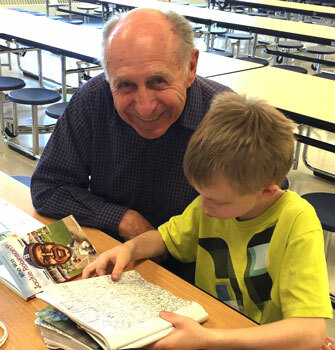 Bulldog Buddies is highlighted with its intergenerational mentoring program. Thank you to Linda Hart with Eliza Jennings, for writing and submitting this special program to the magazine. Thank you to all members for your continued support of PTA! Parents and students are invited to attend the Your Teen event, Navigating the College Process at 6:30 p.m. TONIGHT September 27th at Lake Ridge Academy. The first 20 to register for this event will be eligible for the “Be A Model” raffle. One winner will be chosen and one teenager in that winning family will be featured as a model within Your Teen Magazine. This free event offers a valuable opportunity to gather more information about college: the admissions process, paying for college, discovering a passion and more. A parent expo begins at 6:30 followed by the program at 7 that includes speakers on paying for college, college admission process and others. New this year – parents of grade 8 students for a special presentation on building a great high school experience. To view a flyer of the event, click HERE. Register by visiting yourteenmag.com/register-lra-2016. 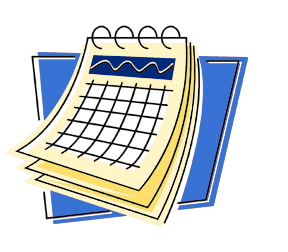 Senior Parents – Please join us at our regular monthly meetings which are held at 7PM in the Media Center at Olmsted Falls High School on the third Wednesday of each month. We look forward to seeing you on October 19, 2016! Today the Ohio Department of Education (ODE) released their annual Local Report Card (LRC). 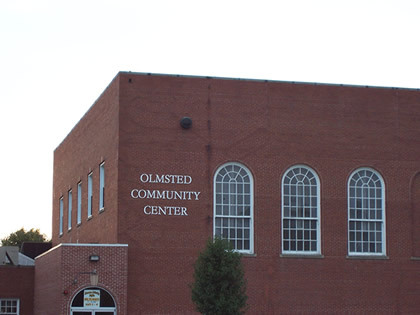 In Olmsted Falls, we’ve always welcomed high standards, and accountability. Our educational philosophy is to inspire and empower our students; not to score high on our state report card. At Olmsted Falls City Schools we feel that a single set of standardized tests that continue to change from year to year is not an accurate representation of our school or student success. I believe that it is professionally irresponsible to publicly report information that has been deemed “unreliable” by Ohio’s elected officials. We are committed to sharing important information about the academic, financial and operational goals and challenges our schools are facing with our community. That is something no state report card had ever been able to share. As such, we are proud to share with residents the first Executive Summary Quality Profile. This is an easy to read report that shares key data in six critical areas of our district’s focus. Residents can see for themselves what our priorities are for using technology in our schools, how we are integrating a 21st century approach to learning, how do our finances compare to other area school districts, how do learning environments impact student success and much more. Each area includes our 2016-17 goals as well as data that is specific to that focus area. 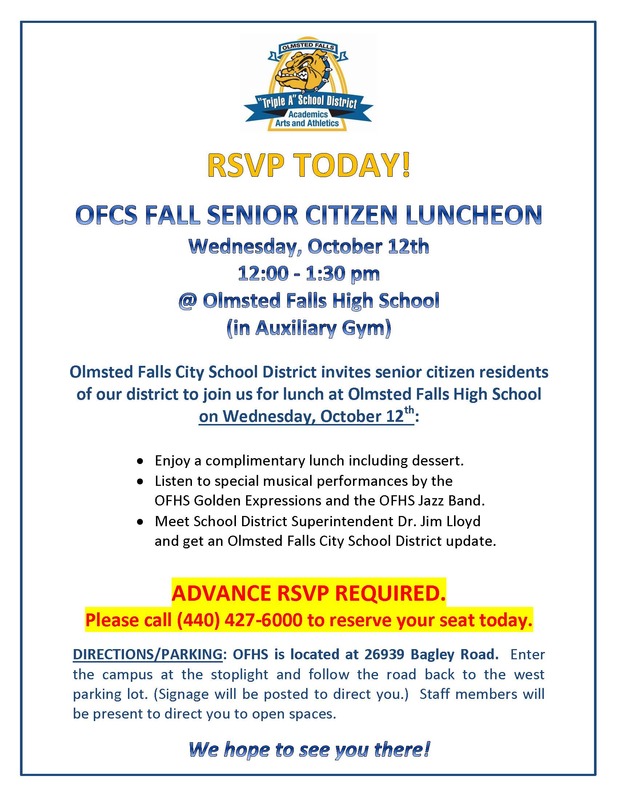 This honest look provides a more complete view of the excellent value that Olmsted Falls City Schools offers and is being mailed to every resident. However you can view this report online now by clicking HERE. 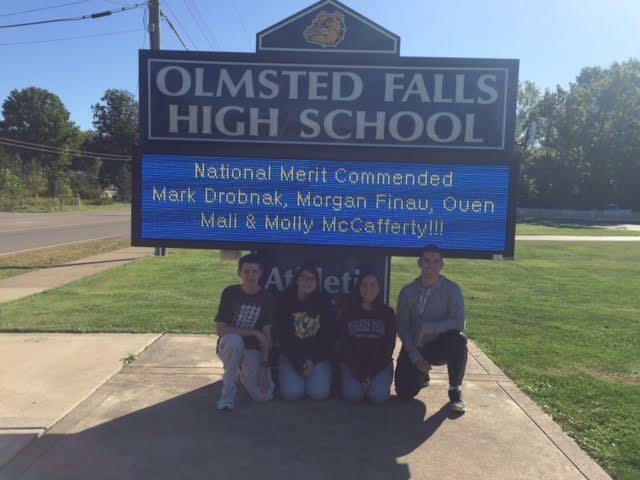 I hope you will take some time to review this Quality Profile so you can see for yourself all the amazing ways that Olmsted Falls City Schools is continuing to inspire and empower all students. Olmsted Falls PTA Council is pleased to announce that Falls-Lenox/ECC, Olmsted Falls Intermediate School, Olmsted Falls Middle School and Olmsted Falls High School have all been recognized as National PTA Schools of Excellence. The School of Excellence designation is the highest honor awarded by National PTA and recognizes schools for their strong and effective family school partnerships. National PTA has recognized 173 schools nationwide and Olmsted Falls is honored to be included within this prestigious group. For additional information about the National PTA School of Excellence Program, please click HERE, and/or contact Olmsted Falls PTA Council President Kelly Walker at klwalker826@earthlink.net. Congratulations to the Bulldog cross-country teams with their dominant performance in defending the Olmsted Cup Tuesday. The boys and girls teams ran extremely well and crushed rival North Olmsted in a combined score of 76- 41, the biggest margin of victory in the three-year history of the race. Both teams had the overall winner, with Sarah Makari victorious for the third time and Griffin Purdy winning for the boys. 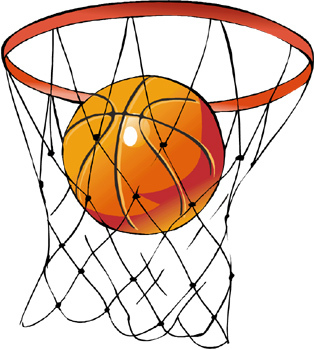 Also scoring and leading the girls to victory were Hannah McCullar, Madi Sobieski, Kaylee Gomez and Abbey Clark, while helping Griffin on the boys side were Andrew Gluvna, Daylon Amposta, Ryan Kolesar and Joe Backus. The team will next be in action this Saturday at the Galion Invitational. Great job, Bulldog, in keeping the cup at OFHS. 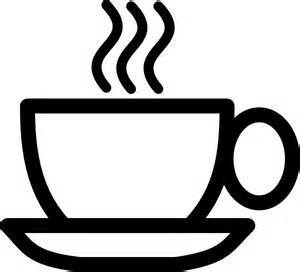 Join Superintendent Dr. Jim Lloyd for a cup of coffee and conversation regarding Olmsted Falls City Schools. Dr. Lloyd will be available to answer questions and discuss hot topics in the district with residents – including the Zero Additional Taxes November Bond Issue. The September edition of the Olmsted Falls Music Association’s Musical Notes is available by clicking HERE. Anyone wishing to submit photos or information for the October newsletter should be sent to Kathy Harris Green, kgreen@chnnet.com, by Friday, September 23rd. To view the OFHS band halftime performance against Westlake on September 2nd, click HERE. The September 9th performance at Lakewood is HERE. OFMA will also sponsor a Fill the Truck fundraiser as it partners with Easter Seals Northern Ohio again. The clothing drive will be in the Board of Education’s parking lot on Oct. 22nd and 23rd. For more details, view the flyer by clicking HERE. Parents and students are invited to attend the Your Teen event, Navigating the College Process at 6:30 p.m. September 27th at Lake Ridge Academy. This free event offers a valuable opportunity to gather more information about college: the admissions process, paying for college, discovering a passion and more. A parent expo begins at 6:30 followed by the program at 7 that includes speakers on paying for college, college admission process and others. New this year – parents of grade 8 students for a special presentation on building a great high school experience. To view a flyer of the event, click HERE. Register by visting yourteenmag.com/register-lra-2016. Senior Parents – Please join us at our regular monthly meetings which are held at 7 p.m. in the OFHS Media Center on the third Wednesday of each month. We look forward to seeing you on September 21, 2016! 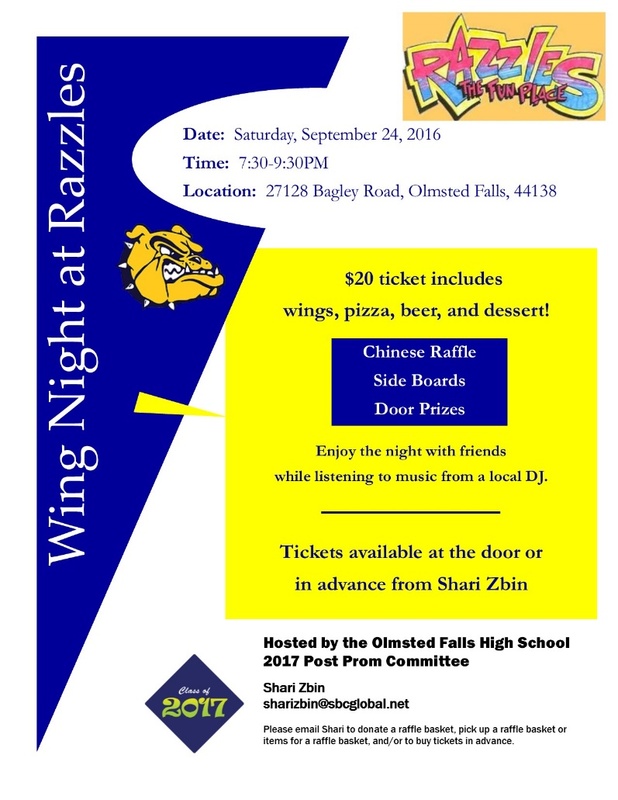 We will have a booth at the Olmsted Falls Varsity Football game on Friday, September 23. Please stop by to purchase a Bulldog Spirit bracelet! Saturday, September 24, from 7:30 -9:30 p.m. The OFHS guidance counselors invite parents to this year’s Coffee & College informational sessions about the college application process. 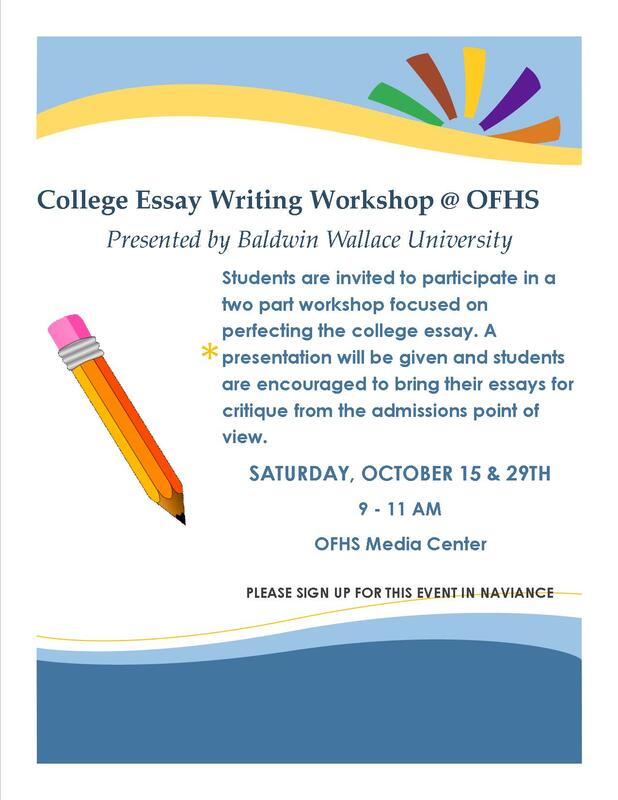 The morning sessions are from 8-9 a.m. October 10th and November 7th in the OFHS Media Center. The evening sessions are from 6-7 p.m.* September 26th and October 24th in OFHS Room W3. (*Please note change in start time for evening events.) All are on Mondays. To see an informational flyer, click HERE. Helping Hands is currently recreating its parent email list. If you would like to receive emails from Helping Hands about upcoming events, please email Mariel Krakowiak at mkrakowiak@ofcs.net. Please include your first and last name as well as the preferred email address to be used. Thank you in advance for helping this group reach out to our community. Spots are still available for the Polaris Career Center’s Clambake Fundraiser set for 6-8:30 p.m. Sept. 23rd in the Polaris Commons. The cost is $40, which includes steamed clams and a buffet of roasted chicken, sausage, clam chowder, corn on the cob, red-skinned potatoes, cole slaw, fruit salad, mac and cheese, desserts and beverages. The award-winning culinary academy chefs and students will prepare the entire meal. Register today by emailing friendsofpolaris@gmail.com or text 216-337-2329. Be sure to include names of those attending and if you have any special seating requests. Admission must be paid in advance. Cash and checks will be accepted. Checks should be made payable to Citizens for Quality Career-Technical Education. Payments may be mailed or dropped off to the attention of Doug Miller at Polaris, 7285 Old Oak Blvd., Middleburg Heights, OH 44130. Connecting for Kids (CFK) provides education and support to families with concerns about their children. It is sponsoring a 7 p.m. September 20th discussion about food allergies, safe ways to set up your home and tips for eating out. Dr. Brian Schroer of Cleveland Clinic Children’s Hospital is the speaker. Free childcare is available, but all who wish to attend must register at connectingforkids.org/register, emailing info@connectingforkids.org or calling 440-250-5563. To see an event flyer, click HERE. Find out everything you want to know about the Crooked River Local Longhouse at its Recruiting Rally & Cookout from 6-8 p.m. on either September 21st or 22nd. The Native Sons and Daughters will provide hot dogs, drinks, dessert, music, activities, crafts and displays at the picnic that will be at the William J. Green Picnic Area, which is off of Valley Parkway near Baldwin Lake. It is south of South Quarry Lane and north of Eastland Road in Berea. You need only attend one of the two picnics to learn about the group and join. The program is geared toward children ages 5 and older. To learn more about the Longhouse, view its flyer by clicking HERE. 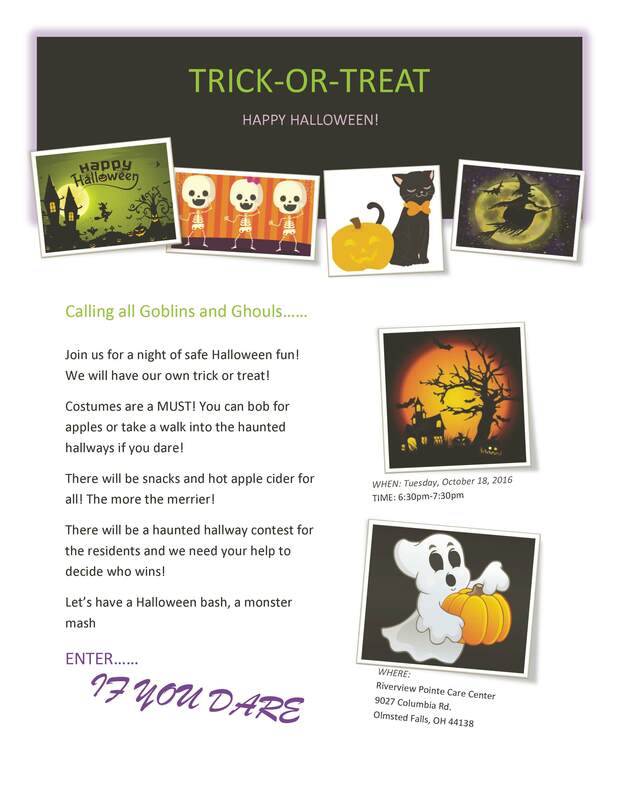 The flyer has a picture that youngsters may color and bring it to the recruiting rally to receive a prize. FOUR-DAY WEEKEND: NO SCHOOL THIS FRIDAY AND MONDAY! There will be no school THIS FRIDAY, SEPTEMBER 2ND due to a district-wide staff development day. 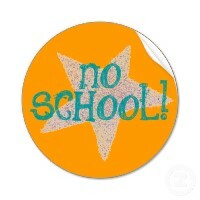 Also, there will be no school THIS MONDAY, SEPTEMBER 5TH to celebrate the Labor Day holiday. Enjoy the long weekend. We’ll see students back in their classrooms on Tuesday, September 6th. Olmsted Falls City Schools is proud to share another new video with our Bulldog community. This latest video focuses on the implementation of the District’s Strategic Plan. Simply click on the image below to view the new video on our District website. 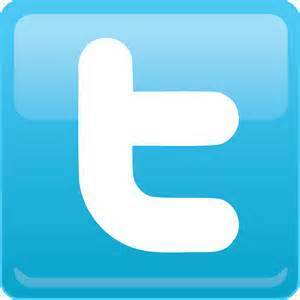 We invite you to share the link with family, friends and neighbors. The next Olmsted Falls Music Association’s meeting is at 7 p.m., this Wednesday, September 7th in the OFHS choir room. OFCS students and parents prove once again what a wonderful and caring community in which we live. 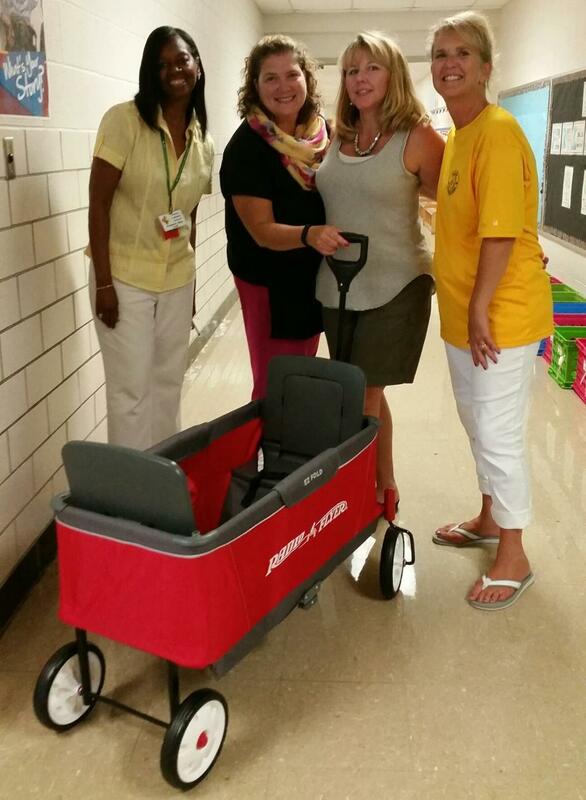 Over the summer months, the children of Olmsted Community Outreach’s summer camp program raised money to purchase a specially designed wagon for the special needs children at the Olmsted Falls Early Childhood Center. Special thanks go out to Cheryl Fudale for spearheading this project, and to the OCO children and their families for participating. The summer campers had fun making crafts for the OCO craft show, selling lemonade, and playing balloon pop while learning a valuable lesson in community service. Pictured (L-R): Valarie Guy, OCO Director, ECC Staff Franca DeMuth & Suzanne Kramer, and Cheryl Fudale, OCO & ECC staff. Dear Senior Class Parents: We invite you to be part of the 2017 Post Prom Committee! 2017 Post Prom will be held at the school from Midnight – 3AM on Sunday May 21, 2017. There are still several committee and volunteer opportunities available! Please join us at our regular monthly meetings which are held at 7PM in the Media Center at Olmsted Falls High School on the third Wednesday of each month. We look forward to seeing you on September 21, 2016! 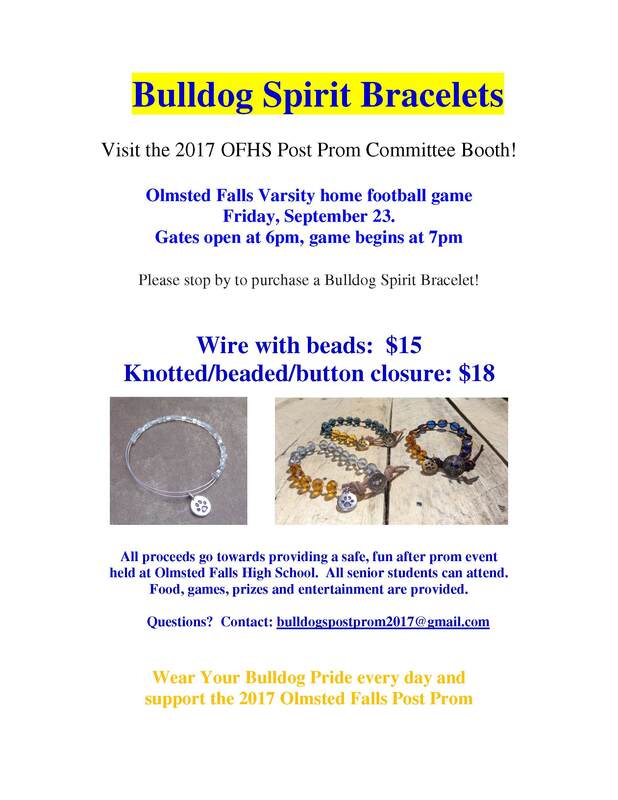 Post Prom will have a booth at the Olmsted Falls varsity football game September 23. 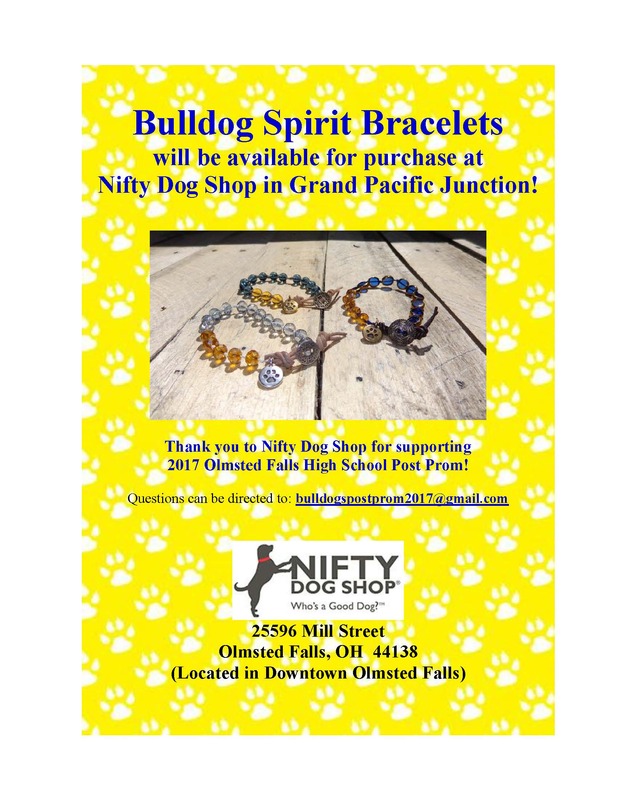 Please stop by to purchase a Bulldog Spirit bracelet, of which varieties are also available at Nifty Dog Shop, 25596 Mill St., in the Grand Pacific Junction. The shop will have the bracelets for sale over the next several months. 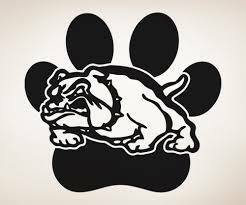 To keep up-to-date on important information, like the Post Prom Facebook page: OFHS 2017 Post Prom Committee; follow the Twitter page: @OFpostprom2017 or send an email to bulldogspostprom2017@gmail.com. 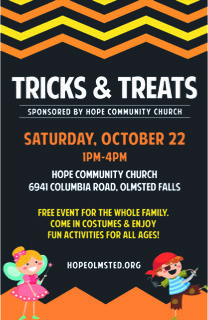 Kids in grades 2-6 are invited to this year’s first Saturday Activity Night at Olmsted Community Center. 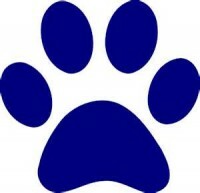 The theme is Bulldog Pride Night. Be sure to wear your Olmsted Falls spirit gear. Enjoy crafts, games, food and a 3D laser lights. For more details, call 440-427-1599 or go to olmstedcc.com. Click HERE to view a flyer of September activities.